An average household carpet should last 10 years; but if you follow our top tips, they will easily last for 15 to 20 years. Here is why rotating furniture extends carpet lifetime so significantly, that it can almost double its lifetime. Heavy items of furniture such as sideboards, dressers and sofas; will make permanent indentations into the pile if you leave them in the same place. Moving things around every 6 months will prevent these from becoming permanent, so the pile can lift back to its natural position, removing the indentation. A light vacuuming will help the pile to lift, or you can brush it back up with a stiff bristled hand brush. Have a look at the foot-wear that occurs in front of chairs and sofas, which can wear down the pile causing a dull flatter area and certainly a darker dirty area. Moving the placement of chairs will spread the wear and extend its life considerably. Having a room change summer and winter could be beneficial in many ways. Summer time moving sofas away from the windows to prevent fading from sunlight and winter time moving chairs closer to the fire or radiators to give maximum comfort in cold weather. This is especially important for people who wish to reduce their heating bills and this is the reason for the old-fashioned sitting round the fireplace, before central heating became prevalent. The Texatherm carpet cleaning process used by SJS carpet cleaning will remove all dirt particles from the trodden areas and the brushes on the machine will lift the pile to its original position, making your 10 year old carpets look good enough to keep for a few more years! 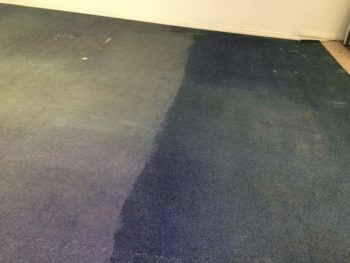 When we visit to provide a free quotation, we can also carry out a test area clean to show you the difference you will see in the before and after of our patented process.